Usage Instructions: Ready to eat. Storage Conditions: Keep in cool dry place. Ingredients: Wheat Flour, Butter, Sugar, Purple Sweet Potato, Egg, Milk, Salt, Leavening Agent (E450i, E500ii, E170i, E341i). 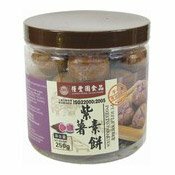 Simply enter your details below and we will send you an e-mail when “Purple Sweet Potato Cookies (糧豐園紫薯餅)” is back in stock!